Porch Swing Creations: Late Night Stampers Treasure Hunt! Feel like going on a little Treasure Hunt? One that sees the Grand Prize winner with a $150 Stampin' Up! shopping spree?? Thought that might peak your interest!! Click on the Tab at the top of my page titled Late Night Stampers Treasure Hunt Participants. Visit each of the blogs listed, looking for the Treasure box (like the picture above) and their clue. Make note of each blog you visit and what the clue on each blog was. All entries will be verified for correctness and then submitted for the Grand Prize drawing. You have from Friday, March 1st until Sunday May 12th (midnight CST) to collect 50 clues and email them to myself to be entered into the contest. The winner will be announced on Wednesday, May 15th on all participating blogs. Demonstrators are currently signing up to fill all 50 spots so check back often to the Participant Page for new additions and clues! Designer Series Fabric - add a whole new world of possibilities to your projects! So what are you waiting for?? 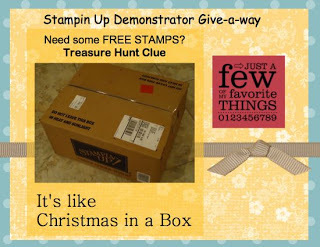 Get started hunting today for your chance to be the GRAND PRIZE WINNER OF $150.00 STAMPIN' UP! SHOPPING SPREE! THANK YOU SO MUCH FOR ALL THE TECHNIQUES AND TUTORIALS!! I will be visiting your blog again, once I find all of the clues. BTW, thanks for the clue.